FEEEDS CEO Ambassador Robin Sanders (center) moderating 'Africa Forum' session on trade with Botswana Ambassador Tebelelo Mazile Seretse (left) and Assistant U.S. Trade Representative for Africa Florie Liser. Washington, DC — Sponsors of the Africa Forum on July 10, 2014 have released their White Paper Report on the Forum - a Dialogue on Key African Issues prior to the U.S.-Africa Leaders Summit event August 4-6, 2014. The partner organizations include FEEEDS Advocacy Initiative, Gallup, The Africa Society, AllAfrica, and Operation Hope. The White Paper summaries the discussions and recommendations by the Forum's panel of experts for the African leaders heading to Washington to meet with the U.S. President. The Forum highlighted the importance of Africa Trade; Key Sectoral Developmental areas such as power, agriculture and the importance of SMEs and the Diaspora; and, emphasized next steps on African Governance Issues. 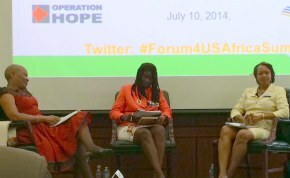 Over 250 invitees attended The Africa Forum at Gallup's headquarters in Washington D.C. Ambassador Sanders discuss latest challenges with finding the missing Chibok girls 100 days, and notes some reported intelligence successes against selected reported Boko Haram suspects. New segment highlight further the need to supply Nigeria's military with the necessary equipment and training, and although corruption is a problem, with additional controls and oversight, it will be critical to ensure Nigeria's military can fight the war against Boko Haram. If you are an Africa-hand (government or non-governmental) activist or development partner focused on Africa you are either directly or indirectly involved with the upcoming Washington, D.C. August 4-6, 2014, US-Africa Leaders' Summit. Fundamentally, the event is incredibly historic as it will be the first time that a sitting U.S. President has invited all the Heads of States and Governments of the Africa Region to a single event, with the exceptions of (Zimbabwe, Central Africa Republic, Eritrea, and Western Sahara), to discuss key Continent issues and the macro U.S.-Africa relationship. The four overarching themes for the Summit are: Investing in Africa’s Future; Peace and Regional Stability, and Governing for the Next Generation. There is some griping, of course, about some aspects of the Summit, but overall the event is a step in the right direction for the United States, even if some parts of the program rankles both Africa-hands and activists on both sides of the Atlantic and bothers many African Leaders. They are all pondering the single most asked question: Why are there no individual heads-of-state meetings with the 50 Leaders attending? China, France, Japan, India all have gotten this right -- holding one-on-one meetings even if they last a few minutes. So the U.S. approach to not doing this does bother many. But this article is not arguing for individual meetings. However, here is a new thought or one possibly considered but dismissed: How could having five sub-regional meetings – short presidential sessions with leaders of West, Central, East, South, and North Africa – be too much for us to do? This option would not require an excessive amount of time (seemingly the reason for no one-on-ones). But, considering the cost, distance, respect-balance ratios at stake as these Leaders travels to the US with probably no less than 20 of their senior government officials, we should be able to manage five meetings. Moreover, the U.S.’s sound policy direction to encourage more regional integration and cooperation on the very issues the Summit will be discussing (peace and security; governance, investment, and the Young Africa Leaders Initiative, aka YALI) would all be further advanced by having regional discussions with the President of the United States. Some factoids which can help put why the misstep on this sole point could not only be strategically wrong for the U.S., but unfortunately further play into the notion by some that the U.S.’s approach is not on par with China, India et al. are: Africa’s population is reportedly 1.5 billion and is on course to reach a population of 2.4 billion people by 2050; and, its average growth rate of 2.45% is likely to remains constant over the next decades. This scenario will move Africa from the third most populated region to the largest; with most people remaining below the poverty level unless we all do some additional things correctly, now. Arguing that demographics and population are strategic issues for the U.S. as it looks forward in the 21st Century for new allies, partners on policy, business, or counterterrorism – Africa is key to the United States; it large current and future demographics makes it more so. The Summit themes are great, the U.S. interest is historic, but we may need to show something else based more on Africa’s perception (not ours) of appropriateness – thus, the suggestion being made here is to consider or re-consider the sub-regional meeting approach. This could further concretize, and synergize our positive rhetoric about raising the US-Africa relationship in an unprecedented manner. We talk about stemming views that the U.S. is not as serious about Africa as China, India, and newcomer Brazil, but the Summit is an opportunity to really do this. Hence calling the Summit historic should not be hyperbole! However successfully the Summit is laid out, the fact that there are no heads of state meetings, even at the sub-region level might be what is remembered most, and that would be a shame. The Summit themes are on target, and the various events such as the recent FEEEDS-Gallup-Africa Society of National Summit-Allafrica Africa Forum, the first to launch, and the array of July 31-August 5, 2014, unofficial and official events will all address key related topics. Interactive dialogue, engagement, and partnership are reportedly the Summit's goals. Again, all good! Although I am cheering for and confident that the Summit in so many ways will be a success, this one issue – not managing the notion of sub-regional meetings with the U.S. President – is an issue many of us cannot understand even if they are tied to a single theme. For example, a West or Central Africa session could focus on peace and security, given the challenges in Mali, Northern Nigeria, Niger, and Central African Republic and terrorism threats to U.S. national interest as a result. A East Africa topic could be the great efforts of U.S. EXIM Bank, Commerce, USAID, USTDA’s, and African Leaders to see what more can be done to bring energy to the 550 million Africans without it. The last three U.S. Administrations – politics aside - have done a tremendous job of both changing the US-Africa post-Cold War paradigm -- creating out of the box, or next to the box signature initiatives from AGOA-to-PEPFAR-to-MCC-to-FEED the Future-to-YALI. All in which FEEEDS-CEO, during diplomatic and non-diplomatic years, has had an opportunity to be involved. In sum, as an American and long-time Africa hand, FEEEDS-CEO is proud of all these things, and proud that the U.S. is having this Summit --hopefully the first of many. Interestingly enough, a Summit-like vision was originally called for in the 2000 Africa Growth and Opportunity Act Legislation; it has taken us 10 years to make it happen. Indeed, it will be important for this first one to be remembered in good light. However, even if the Summit is a success on all fronts, it might be footnoted everywhere that we couldn’t find time to hold, at a minimum, 5 sub-regional meetings. It is not like we haven’t had more than 5 meetings before. If one recalls, and I do, as I was there and attended one, the 2010 Nuclear Security Summit had about the same number of world leaders, 49. According to various official U.S. scheduling reports, there were at least 9-10 bilaterals -- anyway, it was more than 5. In the end, I am voting for this historic Summit to be remembered for all the things we did right, not for the one thing we didn’t do right. Let’s reconsider and at least put sub-regional meetings on the agenda. At recent Congressional Town Hall Breakfast under the leadership of Congresswoman Karen Bass, Ambassador Robin Renee Sanders underscored the importance of keeping focus on the Boko Haram Issue and supporting and working with Congressional leaders and activists, as well as the government to help stem the tide against Boko Haram actions. Other Members of Congress speaking at the event were Representatives Rangel, Maloney, Wilson, and Lee. The FEEEDS Advocacy Initiative along with Gallup, Allafrica.com and the Africa Society of the National Summit on Africa launched the Africa Forum -- the first of the series of events ahead of the historic US-Africa Leaders Summit, which will run from August 4-6, 2014. Other pre-Summit event will start kicking off July 25, 2014, with concurrent activities and events running through August 5, 2014, before the African Leaders meet with President Obama on August 6. Click the link below for the highlights of the FEEEDS-Gallup-Allafrica.com pre-Summit Africa Forum, attending by over 250 Africa-focused organization and African and U.S. officials, including five African Ambassadors to the United States from Nigeria, Botswana, Senegal, Democratic Republic of the Congo, and Tanzania. 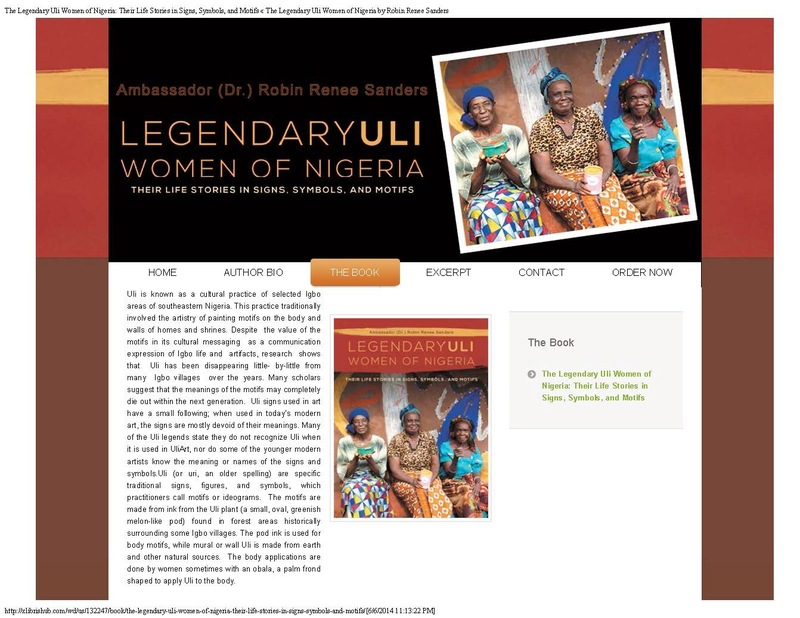 Ambassador Robin Renee Sanders spoke to Al Jazeera America (AJA) recently on the continued unabated violence and kidnapping by Boko Haram on innocent girls and boys in the wide area of Nigeria it controls about the size of Georgia or Wisconsin. Dr. Sanders underscored to AJA that it has never been only girls that BH has kidnapped that they have been recruiting and forcibly taking young boys into their ranks since before 2009. The “Africa Forum’s” primary objective is to foster further dialogue and collaboration in advance of the upcoming US-Africa Summit for African Heads of State and Government. Welcome Remarks: Managing Director Gallup World Poll, Mr. Jon Clifton and His Excellency Ambassador Adefuye, Nigerian Ambassador to the U.S.
Panel Two – The Future of Africa: Key Sectoral Development & Recommendations: Power Africa, SMEs/Diaspora Development, & Agriculture: Mr. Rick Angiuoni, US EXIM Bank; Ngozi Bell – Small Business Administration (SBA); Her Excellency and Deputy Dean, Ambassador Faida Mitifu, DRC Ambassador to the U.S.; Her Excellency Liberata Rutageruka Mulamula, Tanzanian Ambassador to the U.S. Moderator: The Honorable Hank Cohen, CEO Cohen & Woods International, Inc.